We have heard a lot lately about the economy, the very slow recovery and the need for most companies to continue to grow revenue in order to keep the business afloat. For many, sales have been flat or only showing modest increases, with companies hanging on to their hard-earned cash until they are confident the economy will respond in a positive direction. There has been some improvement, but probably not at a rate that gives people confidence that the economy is turning around. So it’s a new year. Do we sit back and do what we have always done, expecting a different result (definition of insanity), or take the bull by the horns (so to speak), and try to do what we can to spur on economic growth? And who will help your company achieve strategic objectives set forth to keep your company moving in the right direction? Maybe you are one of the lucky companies that have all the right people in place, and a sales organization that is truly outstanding. You are ready to face 2013 head-on, with a plan in place and the people to get you where you need to be. Congratulations to you! But if I were to hazard a guess, I would say there are more companies who desire to be in that state versus those who have achieved it. If so, what are you going to do about it? Many companies have increased revenue as a key strategic initiative. Maybe it’s forging into new markets or geographies, finding new distribution channels, or getting a new product to market, but the bottom line is -- we all need sales. And, sales often mean PEOPLE to get that job done. With so much riding on the success of salespeople to help companies meet their strategic objectives, one would assume that a lot of effort and thought has gone into selecting the best people for that job. However, there are many companies that don’t have strong selection procedures in place for these roles. Many companies rely on interviews to select people, especially sales people, because after all, their verbal skills are the only thing that makes them successful, right? Interviewers may ask the person to elaborate on things found in a resume. This is not a bad thing, but does it tell the whole story? Do you have all of the necessary information about the person to be sure they will thrive in your company? Have you ever made a mistake with a key sales hire that you thought would be the “knight in shining armor” – someone with superior communication skills, who could tell a good story, but who was not even remotely matched to the type of sale they needed to do? 1. Find out what motivates the person. This is critical to helping you find someone who will fit within you company, culture, and the job they will be asked to do. Everyone is motivated differently – many leadership training programs teach managers to look for the things that motivate the individual and use those as incentives if possible. It just makes sense that you would try to see what motivates the individual before you hire them, and see how what they desire aligns with what you offer. For example, if someone is highly motivated by money, they may not enjoy a sales job where there is limited upside. 2. Determine their natural sales style. This is important because people tend to excel in situations that play to their strengths. For example, if the product you sell is more technical and tends to have a fairly long sales cycle, a person who employs a more consultative sales style, enjoys learning the technical details, and prefers selling solutions over products, may be a better fit. 3. 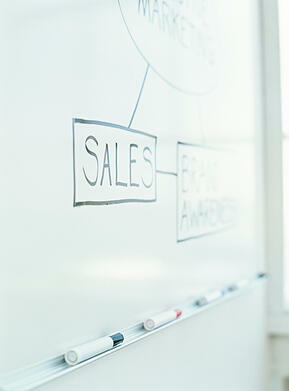 Measure the competencies proven to differentiate sales people. By nature, most sales people make their living persuading others through their verbal prowess, and their ability to persuade others to see their product as something the person could not live without. Certainly you can measure verbal communication style in an interview, but if you allow a candidate’s verbal capability to be the sole determinate regarding their hire-ability, you would be missing many other things that could potentially impede their success down the road. Things like their drive, reading people and situations effectively, knowing when and how to adapt in sales situations, effective time management, accountability and intelligence all play a role in differentiating the average from those with the potential to be great. the Predicting Success in Sales Whitepaper.